BARN'RDS with Positive Plate Award - Barnrds - Fast Food & Roast Beef Restaurant in Wichita Fast food that's good and good for you. Sound too good to be true? It's not if you're ordering lunch or dinner from BARN'RDS. Ken Hertel and his family have been serving quick, tasty and nutritious meals at their east side restaurant for nearly a quarter century now. In November, they were recognized for their efforts when the Wichita Dietetic Association presented them with the Positive Plate Award. The award was created by the group of professional dieticians to highlight area restaurants that make healthy eating easy by following the Dietary Guidelines. BARN'RDS reasonable portion sizes and fresh, wholesome ingredients won praise. "Nearly everything they serve is made fresh daily", explains Glenna Harrison, past president and spokesperson for the Wichita Dietetic Association. "We're very pleased to have been chosen for the Positive Plate Award," Ken says. "It means a lot to us." The family-owned eatery at 2037 N. Woodlawn prepares delicious, nutritious soups, salads and sandwiches from scratch daily. 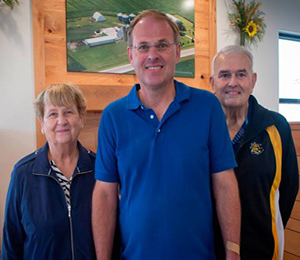 The Hertels - Ken, his wife, Carol, son Troy, and Troy's wife, Maria, have been winning loyal customers by offering fresh, lean foods cooked on site and served quickly. BARN'RDS savory soups includethe 8-ounce vegetablebeef, which boasts only 165 calories and 2.4 grams of fat. Creamy potato soup, chicken noodle soup and chunk steak chili are also popular choices. Everyday, tender egg noodles, freshly chopped carrots and top-quality chicken go into the chicken noodle soup. The vegetable beef soup and chili are prepared with roast beef, not hamburger, making them lean and healthful. This is the same beef used in BARN'RDS signature roast beef sandwiches. The chili contains fresh tomatoes, onions, green peppers and kidney beans. The leader on BARN'RDS menu board of healthful foods is the roast beef sandwich. The Hertels purchase top quality beef, trim it and slow-roast it for 3 1/2 hours to bring out melt-in-your-mouth flavor and tenderness. Other sandwiches include barbeque, hot ham and cheese, baked chicken filet, chicken salad, tuna salad, smoked turkey delight and French dip. Like the roast beef, the chicken is baked fresh daily. It is also a low-fat sandwich and a dieter's dream. The French dip is served on a sourdough hoagie roll with au jus. BARN'RDS also offers whole wheat sandwich buns and Oriental chicken salad. The wheat buns, baked fresh daily, are popular with diners wanting whole grain options. Salads also fill the bill for healthful eating. The Oriental chicken salad is a delicious Favorite with customers. "It's one of our most popular salads, and the flavor and crispness stand up well if you're getting it to go," Troy says. With the Combination Special, diners can enjoy a cup of savory soup with their favorite BARN'RDS sandwich. "We want to give our customers a nutritious option, and this is perfect for cooler weather. They can also choose fries or pasta salad with their sandwich," Ken says. 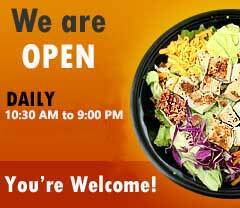 BARN'RDS menu includes other nutritious, tasty salads. Vegetables are cut fresh every morning for the chef, tossed, tuna, and chicken garden salads. For those who consider any meal without dessert incomplete, BARN'RDS offers deliciously decadent extra-large homemade cookies. "We make sure our foods are fresh, appetizing and priced fair," Carol says. "Those ingredients have won us loyal customers over the years."